Blue Diamond has the capacity for extruding the pipe over power, CATV and telecom cable during the manufacturing process. Using a Teflon (trademark of DuPont) tube to protect the conduit, BDI feeds cable into “cross head” dies on our extrusion equipment. Installing the cable in the conduit at our manufacturing facility ensures a clean and damage free cable is delivered to the field. 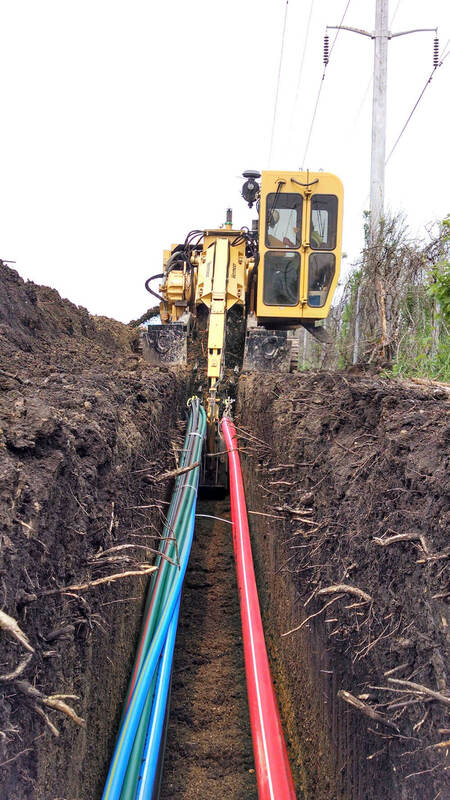 CIC also eliminates the added expense of pulling in the cable in the field under conditions which may be less than conducive to a good clean installation. BDI is listed by UL for specification UL 1990, Nonmetallic Underground Conduit with Conductors and BDI CIC can be manufactured under ASTM D 3485, Smooth-Wall Coilable Polyethylene (PE) Conduit (Duct) for Pre-assembled Wire and Cable. BDI offers UL listed cable with XLP (Cross linked Polyethylene) jackets in various gauges. We also install FAA lighting cable in conduit for airport applications. Fiber Optic cable and coaxial cable are also available in HDPE duct. Per the NEC Code, there are limitations for the amount of cable that can be installed. See the cable fill charts in the technical section of our web site.